Florida women captured six titles, including singles and doubles sweeps in the Women's 35s and 65s, on July 13-18, 2009, at the USTA National Women's 35, 45, 55, 65, 75 & 85 Grass Court Championships at the Germantown Cricket Club in Philadelphia, Penn. 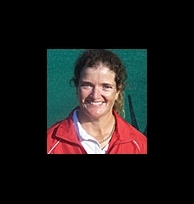 Top-seeded Trish Riddell of Maitland won the Women's 35s singles title, while top-seeded Heide Orth of Palm Coast captured the Women's 65s title. All-white attire was required from tournament participants at the The Germantown Cricket Club, which features a historic clubhouse, 45 tennis courts (4 indoor courts, 24 grass courts, 12 clay courts, 3 Har-tru courts, 2 hard courts), a swimming pool, squash, bowling, cricket and dining facilities. Players also participated in a pro-am with club members. Susie Brown of South Palm Beach won the 3rd place playoff in the Women's 45s singles, while Kerry Young of Maitland reached the 3rd/4th place playoff in the Women's 55s, and Donna Fales of Coral Gables won the 3rd/4th place playoff in the Women's 65s. 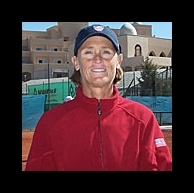 Second-seeded Louise Russ of Boca Raton finished fourth after retiring with injury during the 3rd/4th place playoff in the Women's 75s. Riddell made it a clean sweep of the Women's 35s event by also winning the doubles title, teaming with Mary Dailey of Delray Beach as the top seeds, failing to drop a set through the event. Dailey also won the Women's 45s doubles title, teaming with Erika Smith of Oakland, Calif.
Young won the Women's 55s doubles title, teaming with Tina Karwasky of Glendale, Calif., as the top seeds. Lilian Peltz-Petow of Sarasota and her partner, Molly Hahn of Belmont, Mass., finished fourth in the Women's 55 doubles. 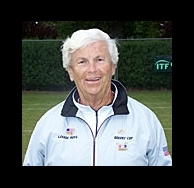 Orth was not to be left out of a sweep of her own in the Women's 65s, also collecting the doubles title as the top seed with partner Suella Steel of La Jolla, Calif. Fales and partner Mary Delay of Woodinville, Wash., won the 3rd/4th place playoff.